Custom Form Authentication in MVC 4 with Custom Authorize Attribute and Session Variable. Today i am going to write about how you can implement a custom authentication in MVC. 1. Create an Empty MVC 4 project. Why we use Empty Project Template? 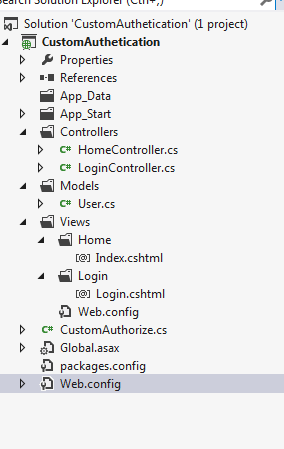 because we don’t want to add default LoginControllers in MVC. 2. Create a new model class ‘User’. Place the class in Models folder. 3. Create a class named CustomAuthorize and, place it in solution with out any namespace. Our custom authorize attribute not only check the form authentication cookie but also check a Session variable named ‘User’. 4. Create a Controller named HomeController and decorate it’s actions with [CustomAuthorize]. Also add a view for the Index action.This home page is available only for authorized users. 5. Now create a controller named LoginController. 6. Add View for Login action in LoginController. 7. Now in web config enable form authentication. Value cannot be null.Parameter name: key Exception in StructureMap/Castle Windsor. If you came across such an error from the below code base, when using structureMap. 1.) Create an MVC 4 Web project. 2.) In the Model folder add a Product class. 3. Create a folder named ‘Repository’ then add an interface ‘IProductRepository’ and its implementation ‘ProductRepository’. 4. Now create a HomeController as Given below, also add an index view. 5. If you run now you get a an error says that ‘No parametrized constructor for controller’. 1. 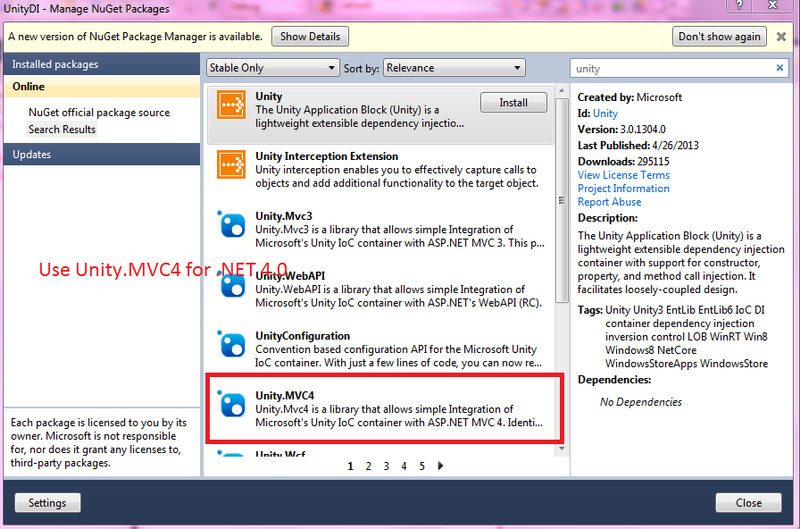 Go to Nuget and add Unity.MVC4. Which will add the dependency for Unity (for VS2010 WITH .NET 4.0). If you are working with .NET 4.5 you can install Unity 3.0. 2. On sucessful installation A BootStrapper.cs file will be added to your solution.Change that file by adding.’ container.RegisterType();‘ in BuildUnityContainer() method. The full code is given below. 1. Install Nuget Packge structuremap not StructureMap.Mvc. 2. Add a BootStrapper class as given below. You need ‘StructureMap’ and StructureMap.Configuration.DSL name spaces. 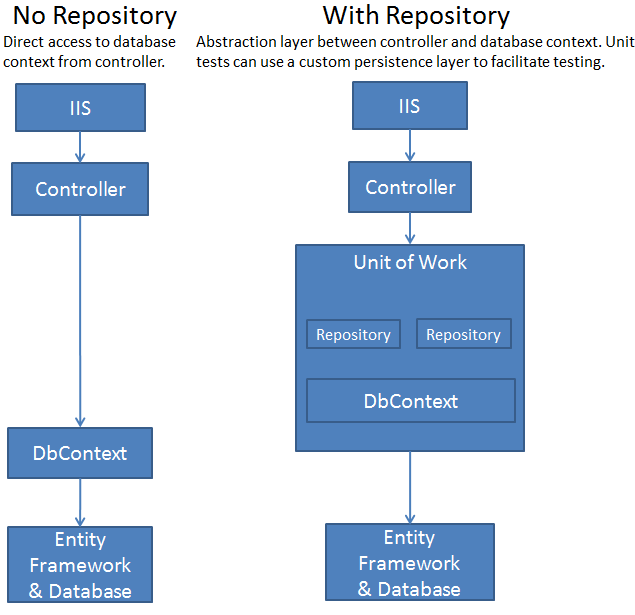 In this post, I am going to present how to design an MVC application Using Enity Framework Repository Pattern, Unit Of Work Pattern and Dependency Injection. 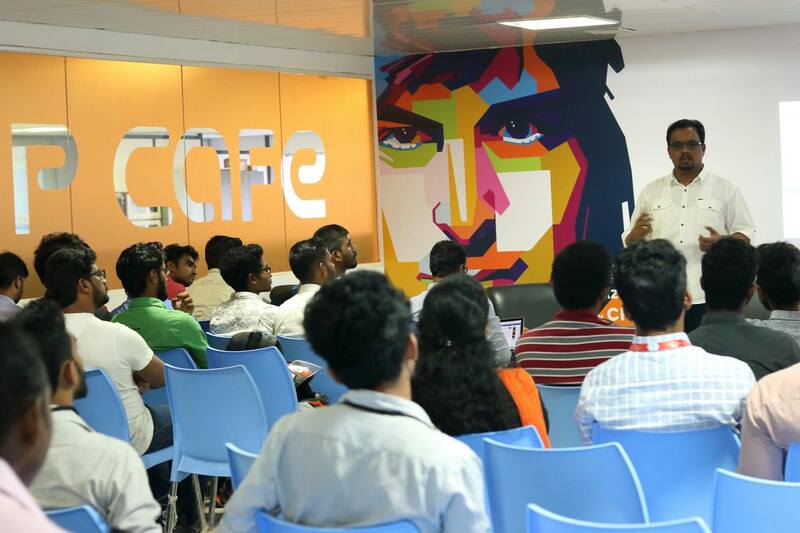 I hope the reader is aware of the basics of MVC, Entity Framework, Repository Pattern, Unit Of Work Pattern and Dependency Injection. Because in this post, i am only concentrating on practical implementation. Entity Framework (EF) is an object-relational mapper that enables .NET developers to work with relational data using domain-specific objects.It eliminates the need for most of the data-access code that developers usually need to write. The Repository and Unit of Work Patterns? The repository and unit of work patterns are intended to create an abstraction layer between the data access layer and the business logic layer of an application. Implementing these patterns can help insulate your application from changes in the data store. Creating a repository class for each entity type could result in a lot of redundant code, and it could result in partial updates. For example, suppose you have to update two different entity types as part of the same transaction. If each uses a separate database context instance, one might succeed and the other might fail. One way to minimize redundant code is to use a generic repository, and one way to ensure that all repositories use the same database context (and thus coordinate all updates) is to use a unit of work class. The unit of work class coordinates the work of multiple repositories by creating a single database context class shared by all of them. Why Need to Inject Controller Dependency? In real life application development, you will see almost all ASP.NET MVC applications are needed to inject its dependent component. You can create component directly inside the controller instead of inject them. In that case the controller will be strongly coupled on those components. If any component’s implementation is changed or new version of that component is released then you must change controller class itself. The example i am using is a small Blog Engine concept, Which include 3 domain objects ‘Blog’, ‘Post’ and ‘Comment’. Look at the solution structure. Please note the Class library names. 1. 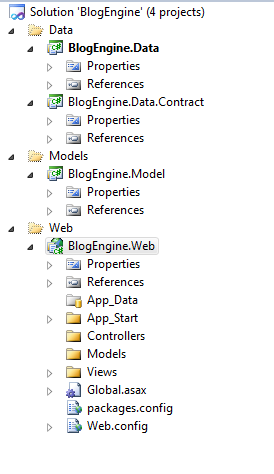 Create 3 domain classes ‘Blog’, ‘Post’, ‘Comment’ in ‘BlogEngine.Model’ Library. Don’t forgot to install Entity Framework Nuget Package. Also do look at the namespaces. 2. Create a Generic Repository Interface ‘IRepository’ in ‘BlogEngine.Data.Contract’ Library. 3. 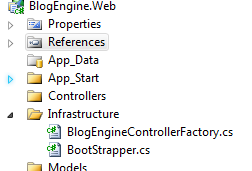 Implement this ‘IRepository’ interface in ‘BlogEngine.Data’ Library as ‘BlogEngineRepository’. 4. Create a DbContext class named ‘BlogEngineDbContext’ in ‘BlogEngine.Data’. 5. 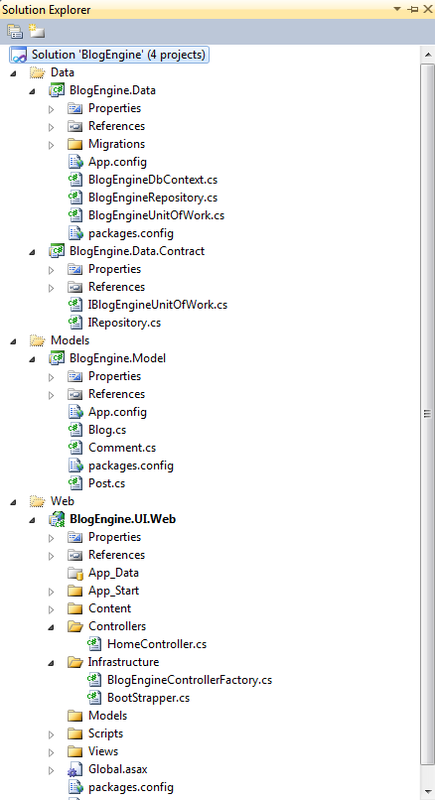 Create a Unit Of Work Interface named ‘IBlogEngineUnitOfWork’ under ‘BlogEngine.Data.Contract’. 6. Implement ‘IBlogEngineUnitOfWork’ in ‘BlogEngine.Data’. 9. Now in Global.asax under Application_Start() add the below code. 10. Now add a HomeController and View. The controller code is given below. 11. A complete Solution Structure Is Given below.